The Brie cheese board set is the perfect sized accessory for a small party or get-together. 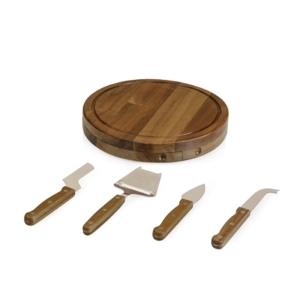 The board is a 7.5" swivel-style, split level circular cutting board made or eco-friendly rubberwood that swings open to reveal the cheese tools housed under the board. The three stainless steel cheese tools have rubberwood handles. A carved moat surrounds the perimeter of the board which helps to prevent brine or juice run-off. The Brie makes a delightful gift.